At the time of this writing (02-19) I’ve long wanted to introduce a line of mono-metal, non-expanding, dangerous game loads for our large handgun and 45-70 offerings. These new “Dangerous Game” (DG) loads are super high quality, very powerful, and will live up to their namesake. Mono-metal bullets have a few advantages (a couple of disadvantages too) over typical non-expanding hard cast bullets. These advantages may or may not be meaningful to each individual, depending on your usage. The advantages are that they are cleaner burning/firing than hard cast bullets. Also, hard cast bullets can smear their nose profile when they hit large bones at close range/high velocity. When the flat nose smears and changes shape, it can impact straight line penetration. The disadvantages are cost and case capacity issues……. 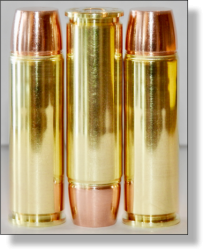 mono-metal bullets made of copper or brass alloys are lightweight for their length. As an example, the 380 gr. bullet used in our DG 45-70 load is as long as a 500+ gr. hard cast bullet, depending on its alloy. This means that (for example) the 45-70 casing, with its limited capacity, will have much less propellant capacity when this long bullet is seated into it, so with this limited powder/case capacity, we have to get creative in choosing a propellant that will give us the velocity we need, but not burn so fast as to raise pressures beyond 43,000 PSI. The case capacity issues become more complex with casings that are much smaller than 45-70, like say a 44 Mag. casing. Lead-based bullets are heavy for their length and generally allow for much more case/propellant capacity. By choosing correct propellants, we can generally get great velocity from the long-for-weight mono-metal bullets. We’ve long ago learned that flat nosed, lightweight, mono-metal bullets penetrate far deeper (in a straight line too) than the typical lead-based bullet of similar weight—FAR DEEPER! This is strictly a personal taste/belief issue, but after having killed a LOT of big critters over many decades, it’s obvious to me that no handgun cartridge that is designed to be fired from a typical packing sized revolver is the equal, or even close to, the equal of a typical high powered elk-rifle cartridge like a 338 Win. Mag. or 300 Win. mag., etc. When using revolver cartridges as a dangerous game stopper, in a packing (much smaller than the S&W X frame) revolver, they start with a purpose designed 454 Casull load. I know many folks have used non-expanding 44 Magnum loads to kill dangerous game, but for me, the 454 Casull and up (480 Ruger/475 Linebaugh, 500 JRH or Linebaugh) is where effective stopping cartridges start. Also, I’ll put a plugin for the quality and strength of the Freedom Arms model 83 and the Magnum Research BFR as two packing sized revolvers that are high quality and are chambered in 454 Casull. These revolvers will generally fit into most holsters made for the Ruger Super Blackhawk. There’s a prevailing argument that any double action revolver is faster and therefore better than a single action revolver, should a bear be on top of you or should a buffalo be goring you. I disagree and would argue that practice with any revolver is the key to proficiency under any set of circumstances. I’ve been carrying single action revolvers chambered in 454, 475 and the various 500’s, for 35 years and since I have shot them a lot, (including in the dark while using a flashlight) I find no advantage in using a double action revolver. When the manipulation of the firearms control features become second nature, the exact types of those features matter little. The 500 S&W is a monumentally powerful revolver cartridge. I have little use for the giant/heavy X frame S&W revolvers, but that is a personal taste/use issue and is no reflection on the X frame revolvers themselves. If I were to use one of those X frame revolvers, it would be that short barreled version for its packing qualities, as you certainly cannot duplicate this type of power for stopping any dangerous animal, in any other type of packing sized revolver, even in that shortish 4-inch barrel, velocities are high enough to generate incredible amounts of crushing power on big critters. Having said all that, you’ll note that one of my test guns is the Big Horn Armory model 89 and in this carbine, this load is even more capable of stopping any earthly critter you need to stop. Since I am not a fan of revolvers with cylinders long enough to house rifle cartridges, if I use the 500 S&W cartridge, it is being used in a Big Horn Armory model 89. 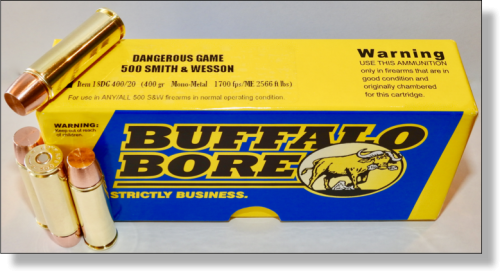 I’m used to carrying Marlin 1895’s chambered in 45-70 with our very powerful magnum loads, but this 500 S&W Dangerous Game load, would, with its bigger bullet diameter, be the equal of (in terms of effectiveness, not energy) our stiffest 45-70 loads. This is a great place to read about how bullet energy (Ft. Lbs.) is not a meaningful gauge of what kills big animals. If you want to seriously swat big critters with a handgun cartridge, this is it! If you’ve followed my writings or practices for very long, you know that I do not believe in the industry wide duplicitous practice of using extra-long barreled laboratory test barrels to establish our advertised velocities. These types of industry practices generate false high velocities that a person would never get in an actual firearm made for field use. Instead, we use real firearms. Below see the velocities we obtained with our firearms with this new DG 500 S&W load. We’ve noticed that the BFR revolvers (in 460 S&W) are giving much higher velocities than the S&W revolvers, even when the BFR revolver has a much shorter barrel……this is generally due to tighter chambers and a smaller barrel/cylinder gap. While I do not own a BFR chambered in 500 S&W right now, I’ll probably buy one, just to include the velocities here. Later, you may see that I add the velocities from a third or even fourth revolver. We chose not to seat this bullet out (like we did with the 460 S&W Dangerous Game load) to increase the powder capacity/velocity as that would make the cartridge too long to cycle through the Big Horn Armory carbine.